More snow is coming to Tahoe ski resorts – most likely 1-3 feet from storms that begin Friday evening. Do the delight of skiers and snowboarders, February has already been a huge month for snow at Tahoe ski resorts. The Tahoe Snow Report below indicates that nine of 14 Tahoe ski resorts have received 70 inches or more over the past week. Alpine Meadows ski resort in Lake Tahoe reported 73 inches of snow over the past week, raising its season snow total to 277 inches. Homewood Mountain received the most snow over the past week among the Tahoe ski resorts, reporting 100 inches (8¼ feet). The family-friendly ski resort on Tahoe’s West Shore now has 297 inches of snow this season. 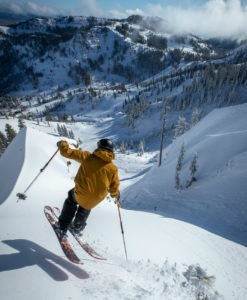 Squaw Valley Alpine Meadows was among the primary benefactors of the storm, recording 7 feet of new snow. It leads Tahoe ski resorts in snow totals for the season with 341 inches. According to OpenSnow California Snow Forecaster, Bryan Allegretto, the snow will begin Friday night (Feb. 8) and bring 2-5 inches by Saturday morning. The snow continues Saturday, especially late in the day when perhaps 2-6 more inches accumulates. The storms also will bring high winds (55-plus mph) and cold temperatures with snow levels dipping to around 3,500 feet. Scattered light snow showers are possible Monday into Tuesday from a weak system. Allegretto believes another cold system could arrive Tuesday night (Feb. 12) into Wednesday and deliver several more inches of snow. The Tahoe temperatures will remain chilly with highs in the 20’s. 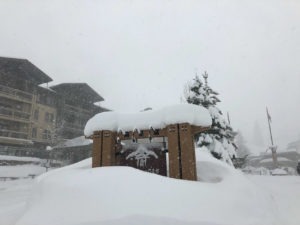 Although conditions over the past week have forced multiple ski resorts to shut down for the day or have minimal lifts operating due to high winds and blizzard-like conditions, the upside is definitely the snow totals continuing to pile up. Located off Interstate 80 at the Norden exit, Sugar Bowl ski resort has received 80 inches of snow over the past week, increasing its season-total to 315 inches. Skiing at Sugar Bowl and most Tahoe ski resorts was off the charts Wednesday and Thursday with powder fresh drawing some great week-day crowds. More snow is expected to arrive Friday (Feb. 8) and continue for several days, bringing an estimated 1-3 feet of snow to Tahoe ski resorts. Skiing Lake Tahoe and snow in Lake Tahoe has never been better this season.